Three-time All-Ireland winner Noel Lane is ready to pass on the torch to Canning and company. 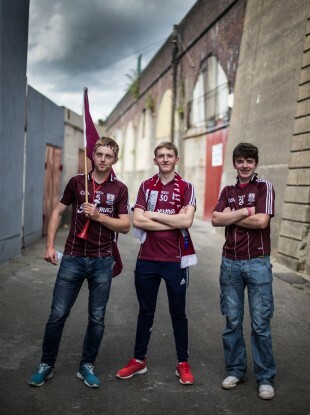 Galway fans Gary McHugo, Michael Fallon and Johnny Conroy - will they see their first All-Ireland win on 6 September? NOEL LANE BELIEVES the time is right for a new generation of Galway hurling heroes to step up. The Tribesmen can end a 27-year wait for Liam MacCarthy when they take on champions Kilkenny on 6 September. It is a repeat of the 1987 decider when Lane famously scrambled home the decisive goal and won his second Celtic Cross. He was on the mark again when Galway beat Tipperary to retain their title the following September but what appeared to be a feast turned out to be the beginning of a famine. Galway have contested five All-Ireland finals since without a win, including in 2001 with Lane as manager when they fell just short against Tipperary. “There are people 30 years of age in Galway that don’t know what it’s like, the passions and the emotions of winning a senior All-Ireland so it’s time now to change that,” he said. “You’d like a new generation to come through. Park it and forget about it and move on. We’re in the present, we’re in the now, and now is the time. No better time than Sunday week. For the first time since the 1980s, Galway will be led into the September decider by a manager who has previous experience of an All-Ireland final. Only for a stellar performance by Henry Shefflin in the drawn game, Anthony Cunningham might have led the county to the promised land three years ago. But Kilkenny escaped with a draw and when it comes to the Cats, there are rarely second chances. The decision to extend Cunningham’s term into a fourth year, with an option for a fifth, now appears to be a prescient one. “A lot of people tried to get rid of him last year,” Lane recalled. “The vote was split and it was the chairman’s vote swung it in his favour. It was three against three. “There was a lot of mood for change. Again, in my opinion that wasn’t the right thing but that’s Galway and the story up to now has proven that it was the right decision to keep him. Although there were some people the last day, at the end of the game had we been beaten, that might have been going down to the sideline to Anthony but he held tough. Three years ago Lane was in Croke Park with the rest of the history boys — Galway’s 1987 winning squad — to celebrate the 25th anniversary of their success and hopefully witness another special day. The wait goes on, even if the optimist in him hopes that this time the outcome will be different. “I’d say some of us went out to watch that final and were a bit blurry eyed. We were hoping we’d have willed them on to win but unfortunately it didn’t happen. The older people in Galway remember us. The younger people wouldn’t know us so it’s time to move away from that. The young people need new heroes and new stars. Email “'Older people in Galway remember us, but the young people need new heroes and new stars'”. Feedback on “'Older people in Galway remember us, but the young people need new heroes and new stars'”.